“The First” is the first single malt produced by Japanese Whisky mastermind Ichiro Akito. He founded the famous Chichibu distillery in 2008 and gained the notorious status in no time. The First hails from seven ex-bourbon casks and one Japanese Mizunara oak cask. Only 2040 bottles of this precious liquid were ever made and the battle for getting them is fierce. Bare witness to the Japanese craze and try a sample of history in the making! *As these bottles represent collector's items, we will not be able to entertain any refunds or exchanges. 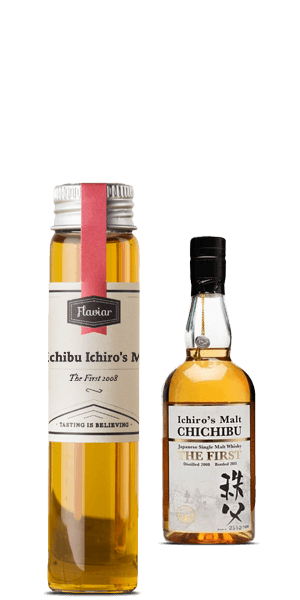 What does Chichibu Ichiro's Malt The First 2008 (Tasting sample) taste like? The Flavor Spiral™ shows the most common flavors that you'll taste in Chichibu Ichiro's Malt The First 2008 (Tasting sample) and gives you a chance to have a taste of it before actually tasting it.